Let’s visit the village of whispers – Kienai Hisako, honoo-en no haka! 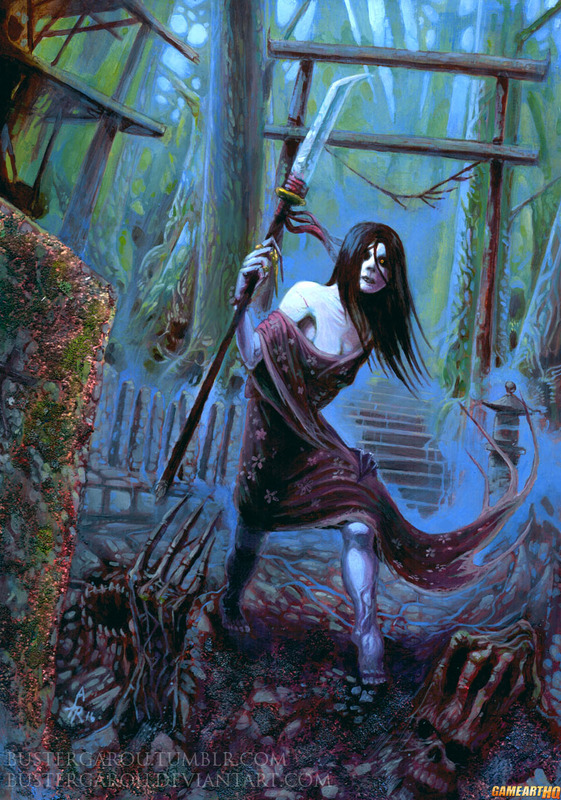 Oh Hisako..so full of grudge..so much anger that haunts this undead soul and drives her to fight and destroy everything that belongs to Ultratech. Not that anything would be wrong with that..Ultratech disturbed her rest after all. This is the first artwork of Hisako from Killer Instinct on Game-Art-HQ and it was made by the long-time contributor BusterGarou who just submitted another awesome Killer Instinct related work for our upcoming Nintendo 64 Anniversary Project. As usual he created it with rather traditional tools like acryl colors and old-fashioned paper instead of using digital tools. I like that he sticks to this form of art-creation. Not that digital art is worse or something, but we have really only a few artists now that stick to traditional tools and their works look still pretty unique in contrast to the digital ones. No wonder it got the daily deviation honor on deviantART.